﻿ Best Price on Villa Silvestre in Coco + Reviews! Offering a garden, Villa Silvestre is located in Coco. Free WiFi is provided throughout the property and free private parking is available on site. The accommodations has a flat-screen TV, air conditioning, terrace and a seating area. All units include a kitchen fitted with a toaster and fridge. A stovetop and coffee machine are also offered. There is a private bathroom with a shower in each unit. Towels and bed linen are featured. Villa Silvestre also includes a barbecue. Bike hire is available at the property and the area is popular for cycling. 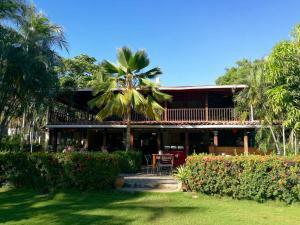 Playa Conchal is 13 mi from Villa Silvestre, while Playa Hermosa is 1.7 mi from the property. The nearest airport is Daniel Oduber Quirós International Airport, 11 mi from the property. For reservations of 3 nights and more, a prepayment deposit by bank transfer is required to secure your reservation. The property will contact you after you book to provide instructions.